Luck of the draw or are older women not welcome on TV? Female equality is something that many people would like to feel has finally been put to bed and women are now being seen on a par with men in most areas. However, it seems to me that the media has so far been a little slow to take up this ideal. Recently the BBC has been under fire over an ageism scandal after a former Countryfile presenter, Miriam O’Reilly, won an age discrimination case against the BBC after being dropped from presenting the TV show. While I agree that this may have been a clear case of age discrimination I can’t help but wonder if the same would have happened if Miriam was a man. On many TV programs in modern times it seems that it’s fully acceptable for a male presenter to be of an older age. In fact this is often seen as “more intelligent” or “experienced” most older male presenters are thought of very highly, and often it’s justified. However, I do wonder if it is possible for women to also become “experienced” presenters when in fact I see very few older women on television. I’m not sure I have ever watched a television show with both a male and female presenter (quite a common scenario) where the woman noticeably older than the man. Just think about most news programmes or even popular family programming such as Dancing on Ice (Phillip Schofield being considerably older than both Christine Bleakley and Holly Willoughby) and Strictly Come Dancing (again the older Bruce Forsyth presents with the younger Tess Daly). It seems that it is near impossible for an older woman to be able to hold onto her job. IOnly a few years ago the BBC came under fire for firing an older judge of Strictly Come Dancing, Arlene Phillips in favour of much younger, though less experienced Alesha Dixon. I was shocked to hear recently that a set of BBC documentaries on classical civilisations featuring Mary Beard, an expert in her field, were openly criticized. This had nothing to do with the content of the programs or the filming of them. All criticisms were about Mary Beard herself and many people felt that she wasn’t pretty enough to be on television. This wasn't some cheap reality show, it was a serious documentary that required someone of broad and extensive knowledge of the subject so I was shocked that even so people were still so homed in on judging the presenter by the way they look, despite Mary Beard being an expert in the field; so on paper the perfect person for the job. I couldn’t help but wonder if the same would be true of an older male presenter and I knew instantly that almost certainly it wouldn’t be the case. There are many older male presenters such as David Dimbleby and David Attenborough, yet nobody would dare raise a complaint against them because they are now considered some of the "great" TV presenters and age has little effect on their careers. In my opinion that is as it should be but surely the same rules should apply for both men and women. Why don't women get the chance to be some of the "great" TV presenters too? However, in the case of Mary Beard, this wasn’t a discriminatory decision by a superior it was the views of members of the general public and this can’t be controlled in a society with a strong freedom of speech policy. So maybe this isn't an issue where blame can be laid oh-so-easily on the shoulders of senior workers within television companies. If a lot of people are unhappy with presenters then surely the TV companies have to deliver what people want. However, I personally feel that to a certain extent women, particularly those who have spent their whole careers in the media, should be able to continue on television even at older ages. I think that this is the only way to combat the still thriving combination of sexism and ageism on today’s TV. So is it that the image of the strong independent woman only lasts until middle aged? I feel that in the case of the media and TV presenting in particular the answer to this might be something that we wold rather ignore. I really, really like this article simply because it asks such a key question to today's society - why is it that female equality still isn't there? 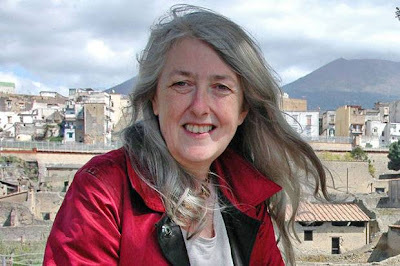 The gap between genders becomes clear when we observe how there are still subtle but terrible barriers in place for even talented women such as Mary Beard.